CEO Tim Brennan calls Penfield Marine “the new kid on the block”. Commercial manager Penfield is barely three years old, tucked away in the quiet Southport section of Fairfield, Connecticut, and moderating its size and ambitions as it stakes out a share of the panamax and aframax markets. 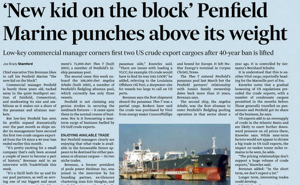 But low-key Penfield has seen its profile expand dramatically over the past month as ships under its management have secured the first two crude cargoes exported from the US since a 40-year ban ended earlier this month. “It’s pretty exciting for a small company that’s only been around a couple of years to become a part of history,” Brennan said in an interview with TradeWinds this week. Penfield vessels have secured the cargoes in each of its operating sectors. The first travelled at the turn of the year onboard Ionia Management’s 73,000-dwt Theo T (built 2003), a member of Penfield’s 22-ship panamax pool. The second came this week onboard the 106,000-dwt Angelica Schulte (built 2005), a member of Penfield’s fledgling aframax pool, which currently has only three vessels. Penfield is not claiming any genius strokes in securing the landmark fixtures—it came upon them in the normal course of business. Nor is it forecasting a near-term surge of business fuelled by US Gulf crude exports. But Penfield managers clearly are enjoying that what trade is available in the foreseeable future appears to be destined for either panamax or aframax cargoes—its two niche trades. Brennan, a former president of pools power Heidmar Inc, was joined in the interview by his founding partner, ex-Glencore chartering man Eric Haughn, and Penfield’s vice president for finance, James Knowles. What's been great for our market is that the volumes have been limited enough that it naturally finds itself into the aframax or panamax side,” Knowles said. “There are issues with loading a VLCC, for example. US crude would have to find its way into LOOP,” he added, referring to the Louisiana Offshore Oil Port, a deepwater site for vessels too large to call on US ports. Brennan says the first shipment aboard the panamax Theo T was a partial cargo. Brokers have said the crude was purchased by Vitol from energy major ConocoPhillips and bound for Europe. It left Nu-Star Energy’s terminal in Corpus Christi, Texas. The Theo T entered Penfield’s panamax pool last March but the Penfield partners’ relationship with Ionia’s family ownership dates back more than 15 years, Brennan says. The second ship, the Angelica Schulte, was the first aframax to enter Penfield’s fledgling pooling operation in that sector about a year ago. It is controlled by Germany’s Bernhard Schulte. It is understood that this is another Vitol cargo, reportedly heading for the Marseille port of Fos. Knowles notes that a gradual loosening of US regulations preceded the crude exports, with a number of condensate cargoes permitted in the months before. Those generally travelled on panamaxes and Penfield got its share of the business, he says. US exports add to an oversupply of crude in the Atlantic Basin and are likely to exert further downward pressure on oil prices there, Knowles says. While near-term factors would not appear to dictate a big trade in US Gulf exports, the impact on tanker tonne miles remains to be seen, he adds. The pricing relationships don't support a huge volume of crude exports,” Knowles said. Brennan added: “In the short term, we don’t expect a lot. Longer term, interesting trades could develop.